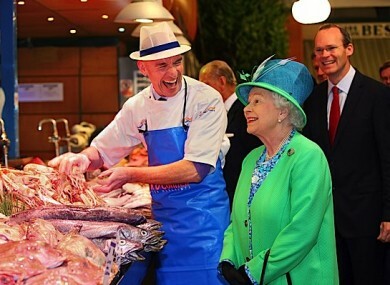 That photo: Cork fishmonger Pat O'Connell with Queen Elizabeth in May. THE NOW FAMOUS photo of Queen Elizabeth and a Cork fishmonger grinning as she visited the city’s English Market earlier this year has been signed by the fishmonger and sent to Buckingham Palce. The British embassy has confirmed to TheJournal.ie that the ambassador requested the photo be signed by fishmonger Pat O’Connell and that it has now been sent to Buckingham Palace. Taken by freelance photographer Valerie O’Sullivan for Maxwells, the photo has become one of the outstanding images of the monarch’s historic four-day visit to Ireland which was rounded off with a trip to Cork where she was warmly received by the natives. O’Connell told the Irish Times that the British ambassador Julian King had recently called to his stall to ask him to sign the photo and revealed he signed it with a small message saying how successful her visit had been and wishing her well for the future. He added it was a bit of a shock to think that he was asked to sign a photo of himself and the Queen. Email “Iconic photo of Queen's Cork visit signed and sent to Buckingham Palace”. Feedback on “Iconic photo of Queen's Cork visit signed and sent to Buckingham Palace”.